This entry was posted in Cetaceans, Dolphins and tagged Japan, Japanese whaling, minke whale, Porpoise slaughter by Kirsten Massebeau. Bookmark the permalink. I was reading through some of your blog posts on this website and I think this site is real instructive! Retain posting . Glad they are back to whaling and wish the US would have left 3 kamikazi planes for the steve”sting ray” irwin, the bob barker, and the gojira”oops adi gail 2″. I want a whale steak medium rare. God bless the Japanese and grant them relief from the devastation of the tsunami. Mike I am sorry you are so angry and so negative. To be a part of saving whales and dolphins is a movement like no other. People from all walks of life with different interests have joined this important cause, saving whales and dolphins. We the activists feel the deepest empathy for the Japanese people and all the living things of Japan and Japan oceans that have been effected by the tsunami and the Fukushima power plant collapse. Many of us have sent support to the Japanese people and that includes the Sea Shepherds and their supporters. But we cannot stand by while the people of the sea are murdered in cold blood. We, the dolphin, whale, ocean, activists grow in numbers everyday, and won’t stop fighting for what we know is right, saving the people of the sea. Please come join us save our oceans and her inhabitants. Poor Minke Whales swim right up to boats, curious and friendly. Japs, who are as primitive and savage today as in past wars, simply reach over and slaughter them. Savages. The minke is shy and graceful in most cases. I find it hard to take that the IWC classifies them like cows, calling their pods, stocks and their children, calves. I will never use that terminology because I find it distasteful, supporting outdated terminology. The minke is a sentient being and should really be treated like a non-human person, not a piece of meat. 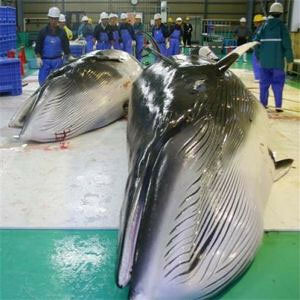 The Japanese have gone back to killing whales post tsunami. They made a commitment to stop killing whales and yet here we are again. Well, I followed the link and asked Prime Minister Nato Kan to cease whaling operations. I am hoping we can make some impact before they start killing dolphins in Taiji. The Japanese are whaling again. How sad just when we thought they had stopped. I can’t believe that the poor Dalls porpoise is not going to escape their harpoons this year after all, not to mention the minke whales, and dolphins. Support the Sea Shepherds, and Wdsf/ProWal piling sheets.